Using near infrared saunas and “full-spectrum” saunas (which also output near infrared) cause accelerated aging of the skin. The cumulative research to date shows that near infrared causes production of reactive oxygen species (ROS) in the skin which must be detoxified consuming the body’s usually-over-taxed antioxidant resources. That ROS also causes the activation of 599 genes, in particular one that causes production of the matrix metalloproteinase-1 enzyme, which damages the skin resulting in accelerated aging of the skin. 11 or more of those genes relate to how the body protects itself from genetic damage. Several papers show that near infrared decreases protection from genetic damage, and that all of that gene activation has the potential for promoting cancer. These risks and downsides far outweigh potential benefits. In the last couple years, near infrared and “full-spectrum” saunas, which include near infrared, have become common. But High Tech Health, with more than 20 years of experience in far infrared saunas is often asked, why haven’t we embraced this “new” technology? More than one company even brags about how much more power they have in the near infrared spectrum, but is near infrared really a good idea? About half of IR-A energy that hits the body is absorbed in the dermis (Schroeder et al., 2006). The current research shows that near infrared is a bad idea for saunas. First of all, it is well known from glass and steel workers that near infrared between 800nm and 3000nm over time promotes cataract formation, a clouding of the lens of the eye (ICNIRP 2013). Second of all, and the primary focus of this paper, the research shows that near infrared causes damage to the skin. The research shows that exposure to near infrared accelerates the aging of skin and is part of what ages a person’s skin when they spend too much time out in the sun. It also shows that near infrared produces oxidative stress in the skin and several papers show it has the potential to cause cancer. While there are research papers showing positive effects on skin related to wound healing these are simply not applicable or relevant in a sauna. I’ll go into that in more detail, but first, let’s look at the research that shows harm to the skin from near infrared. Starting with Kligman’s paper in 1982, she first noted that near infrared alone caused skin damage in albino guinea pigs similar to that from ultraviolet light. Kim et al. 2005 found near infrared alone caused wrinkles in hairless mice. Since then it has been demonstrated and confirmed that near infrared (IR-A) causes production of reactive oxygen species (ROS) in the mitochondria inside human dermal fibroblasts (those are cells in the dermis layer of the skin which produce collagen and the extracellular matrix – healthy collagen gives skin its structure and youthful appearance). These ROS cause harm on their own, but they also trigger a signaling pathway that results in increased gene expression of matrix metalloproteinase-1 (MMP-1) in human skin (Schieke et al., 2002; Kim et al., 2006; Schroeder et al, 2007; Buechner et al., 2008; Cho et al., 2008; Schroeder et al, 2008; Calles et al, 2010; Costa et al., 2015). Near infrared does not trigger increased expression of the tissue inhibitor for MMP-1 (TIMP-1) and therefore means that significant amounts of the MMP-1 enzyme are produced in the skin. This is a major factor in skin aging because the MMP-1 enzyme degrades type-1 and type-3 collagen as well as elastic fibers (Krutmann 2011 ßSkin Aging in Nutrition for Healthy Skin (book)first reference in Costa 2015). Reactive oxygen species (ROS), such as super oxide (02-), are bad because they cause damage and need to be detoxified out of the body. That process of being detoxified out of your body means that they consume some of your body’s supply of antioxidants leaving you more vulnerable to harm from other toxins. Schroeder 2007 specifically found that IR-A led to generation of super oxide (02-) originating in the mitochondria of human fibroblasts leading to MMP-1 expression, as well as increased oxidized glutathione (glutathione is an antioxidant — oxidized glutathione is the form it has after it is “spent”). Schroeder 2008 also found a reduction in antioxidants in the skin after near infrared exposure and further confirmed that antioxidants could be used to prevent MMP-1 expression confirming that the oxidative stress was the cause of the MMP-1. Costa 2015 found that after near infrared exposure there was a significant reduction in catalase and superoxide dismutase. Catalase and superoxide dismutase are both enzymes that protect you from ROS. In this study, specifically there was a 20.8% reduction of catalase found after 48 hours, and a 15.7% and 24.7% reduction of superoxide dismutase at 24 hours and 48 hours, respectively. Darvin et al. 2010, another paper that measured free radical production after near infrared exposure, concluded “Hereby, it has to be considered that IRA irradiation is used only in cases of lesions and injury, i.e., infrequently.” Their point being that due to the production of free radicals, habitual IR-A exposure, as you would have in a near infrared sauna, is to be avoided. Near infrared (IR-A) has been found to suppress the apoptosis that would normally occur after ultraviolet-B (UVB) exposure (Jantschitsch 2009). That apoptosis is the dying of cells that have sustained genetic damage preventing them from living on and possibly becoming malignant. Calles 2010 found that near infrared exposure didn’t just upregulate MMP-1 expression in human dermal fibroblasts – it actually affects the expression of 599 genes. 11 of those genes relate to apoptosis. Costa 2015 confirmed that the reduction in apoptosis is dangerous when they showed that there was also decreased repair of DNA by a reduction of GADD45a protein (specifically 57.2% decrease at 48 hours, and 34.6% decrease at 72 hours). Kimeswenger 2016 specifically looked at near infrared and the anti-apoptotic effect on human melanocytes. 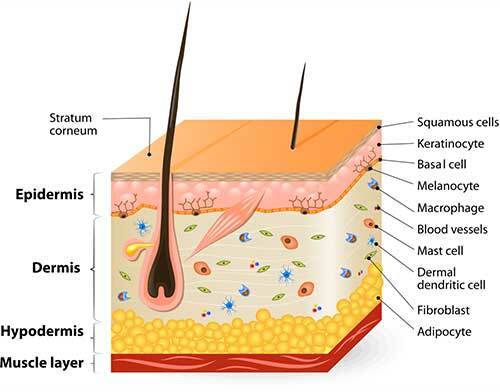 Melanocytes are cells in (among other places) the lower layer of the epidermis and produce melanin, which absorbs ultraviolet light to protect the skin. The worst form of skin cancer is melanoma and it forms in melanocytes. In this study, at 24 hours, by itself IRA did not affect apoptosis, but in combination with UVB it significantly reduced apoptosis. To investigate this, they then looked to see what effect IRA was having on DNA repair (since DNA damage is the major trigger for ultraviolet radiation-induced apoptosis). They found that at 6h, 24h and 48h there was no effect from IRA on DNA repair. They also examined the apoptosis pathways and showed that IRA was inhibiting activation of caspase-8 and altering the expression level of several apoptosis-related proteins. They concluded that “Since IRA does not affect the repair of DNA-damaged melanocytes, the enhanced survival of severely DNA-damaged melanocytes might support the accumulation of UVB-induced mutations, malignant transformation, and ultimately melanomagenesis.” This means that evidence supports the possibility that IR-A is what makes UVB potentially cause the melanoma form of cancer. Even though the research is still coming in and there is much left to examine, High Tech Health simply cannot sell a product with evidence that it might promote skin cancer. The effect from near infrared takes place over a few days and it would be ridiculous to require sauna users to avoid sunburns for days after using the sauna. As you will read in the next section, near infrared offers no benefits that would offset this level of risk. So Higher Levels of Near Infrared are Definitely Bad, but What About Research that Showed Benefits? There are papers that have noted benefits from near infrared. Most of those relate to wound healing which I will discuss in the next section. Some of those can be explained by the experiment failing to wait long enough to see the delayed effects. The research shows that harm from near infrared exposure takes place over a few days after exposure. As noted in the Costa 2015 paper mentioned above, reduction in antioxidant enzymes were noted after 24 and 48 hours. Costa 2015 also showed that the increase in MMP-1 can show up after 72 hours and not be seen at 24 and 48 hours. A much earlier paper, Kim 2006, actually measured benefits from one dose of near infrared measured at 24 hours (decrease in MMP-1 and increase in type I procollagen — procollagen is an earlier step in producing collagen, so this marks an increase in new collagen production). However, that same experiment then tested again after doing three exposures per week for 4 weeks and found the opposite, significant MMP-1 expression and an associated decrease in production of type I procollagen. Any paper showing a benefit to skin from near infrared exposure needs to be considered relative to the time period used for testing. Barolet 2016 speculates that maybe there is a low enough level of near infrared that is high enough to trigger a biological reaction in the body to protect itself, but below the levels that we know cause harm. This idea is called “hormesis”. Hormesis is any process in a cell or organism that exhibits a biphasic response to exposure to increasing amounts of a substance or condition. Within the hormetic zone there is generally a favorable biological response to low exposures to toxinsand other stressors. The Barolet et al. 2016 paper was considering applications called low level laser therapy (LLLT, also called photobiomodulation, or PBM) in particular due to their lower power and that benefits to skin were primarily found in those papers. It should be noted that low level laser therapy has little in common with how near infrared is emitted in saunas. These therapies use low power lasers or LEDs applied at the surface of the skin to control the power level. Near infrared heaters used in saunas are significantly higher in power, have a much wider output spectrum, and by necessity must be placed a distance from the body so they can radiate near infrared into the entire cabin or space. Near infrared heaters in saunas cannot accurately control the amount of power hitting the skin because there is an exponential change in power relative to distance making it impossible to guarantee a power level at the skin’s surface unless the occupant will never move inside the sauna. As you would expect based on that, there is no research at this time supporting the idea that results from using LLLT or PBM could apply to near infrared emitters in saunas. Equating those two is irresponsible (and yet there is at least one sauna company doing exactly that). Whether or not hormesis is even possible is not yet certain based on the current level of research. More importantly, it should be noted that if there is a “hormetic zone” for near infrared, we definitely do not know what it’s upper or lower threshold levels are, or even if it depends upon other specifics of the source of near infrared (such as bandwidth, or coherence). Even if the hormetic zone exists, there would be significant difficulty in designing a sauna around it such that you could move around in the sauna without over- or under- exposing yourself. Given the current state of understanding, it is not possible to design a safe sauna that utilizes a hormesis effect with near infrared. First of all, if you have an open wound, you should seek medical attention, not get in your sauna. Saunas are not for wound healing. Any company suggesting their sauna is suitable for wound healing needs to get FDA approval for such a claim and is in violation of the law. But worse than that, as I explained above, those company’s products are likely causing skin damage instead. As I stated above from the conclusion of the Darvin 2010 paper, IR-A radiation appears to have a use for treating lesions but should only be used infrequently due to negative side effects. In other words, IR-A has no place in a sauna designed to support well-being and habitual use. There is much that is still yet to be understood about near infrared and skin, but what we do know is that higher levels of exposure cause harm including decreased antioxidant defense, accelerated aging of the skin, and the potential to cause cancer. We do not know if a low-enough level could be used to trigger benefits, and if it can, we definitely do not know what that safe level is. Near infrared saunas and saunas that include near infrared, such as “full-spectrum” saunas, do not offer any benefits that outweigh these risks and cannot be considered safe at this time. High Tech Health has spent significant time studying this technology in depth, but unfortunately for consumers, it appears that other sauna companies have not. Kochevar IE, Pathak MA, Parrish JA. Photophysics, photochemistry and photobiology. In: Freedberg IM, Eisen AZ, Wolff K, eds. Fitzpatrick’s dermatology in general medicine. New York, NY: McGraw-Hill; 1999: 220-229. Schroeder P, Schieke S, Morita A. Premature skin aging by infrared radiation, tobacco smoke and ozone. In: Gilchrest B, Krutmann J, eds. Skin Aging. Berlin/Heidelberg, Germany: Springer-Verlag; 2006:45-54.
International Commission on Non-ionizing Radiation Protection (ICNIRP) Guidelines On Limits of Exposure to Incoherent Visible and Infrared Radiation. Health Physics. 2013; 105(1):74-96. Yaar M. Clinical and histological features of intrinsic versus extrinsic skin aging. In: Gilchrest B, Krutmann J, eds. Skin Aging. Berlin/Heidelberg, Germany: Springer-Verlag; 2006: 9-21. Kligman LH. Intensification of ultraviolet-induced dermal damage by infrared radiation. Arch Dermatol Res. 1982; 272:229-238. Kim HH, Lee MJ, Lee SR, Kim KH, Cho KH, Eun HC, Chung JH. Augmentation of UV-induced skin wrinkling by infrared irradiation in hairless mice. Mech Aging Dev. 2005; 126: 1170-1177. Kim MS, Kim YK, Cho KH, Chung JH. Regulation of type I procollagen and MMP-1 expression after single or repeated exposure to infrared radiation in human skin. Mech Ageing Dev. 2006; 127:875-882. Schroeder P, Pohl C, Calles C, Marks C, Wild S, Krutmann J. Cellular response to infrared radiation involves retrograde mitochondrial signaling. Free Radic Biol Med. 2007; 43: 128-135. Buechner N, Schroeder P, Jakob S, Kunze K, Maresch T, Calles C, Krutmann J, Haendeler J. Changes of MMP-1 and collagen type 1 alpha 1 by UVA, UVB and IRA are differentially regulated by Trx-1. Exp Gerontol. 2008; 43: 633-637. Cho S, Lee MJ, Kim MS, Lee S, Kim YK, Lee DH, Lee CW, Cho KH, Chung JH. Infrared plus visible light and heat from natural sunlight participate in the expression of MMPs and type I procollagen as well as infiltration of inflammatory cell in human skin in vivo. J Dermatol Sci. 2008; 50: 123-133. Schroeder P, Lademann J, Darvin ME, Stege H, Marks C, Bruhnke S, Krutmann J. Infrared radiation-induced matrix metalloproteinase in human skin: Implications for protection. J Invest Dermatol. 2008; 128: 2491-2497. Calles C, Schneider M, Macaluso F, Benesova T, Krutmann J, Schroeder P. Infrared A Radiation Influences the Skin Fibroblast Transcriptome: Mechanisms and Consequences. J Invest Dermatol. 2010; 130: 1524-1536. Costa A, Eberlin S, Clerici SP, Abdalla BMZ. In Vitro Effects of Infrared A Radiation on the Synthesis of MMP-1, Catalase, Superoxide Dismutase and GADD45 Alpha Protein. Inflammation & Allergy – Drug Targets. 2015; 14: 53-59. Krutmann J. Skin Aging. In: Nutrition for Healthy Skin. Krutmann J, Humbert P, eds. Springer-Verlag; 2011: 15-24. Darvin ME, Haag S, Meinke M, Zastrow L, Sterry W, Lademann J. Radical production by infrared A irradiation in human tissue. Skin Parmacol Physiol. 2010; 23(1):40-46. Jantschitsch C, Majewski S, Maeda A, Schwarz T, Schwarz A. Infrared Radiation Confers Resistance to UV-Induced Apoptosis Via Reduction of DNA Damage and Upregulation of Antiapoptotic Proteins. J Invest Dermatol. 2009; 129: 1271-1279. Kimeswenger S, Schwarz A, Fodinger D, Muller S, Pehamberger H, Schwarz T, Jantschitsch C. Infrared A Radiation Promotes Survival of Human Melanocytes Carrying Ultraviolet Radiation-Induced DNA Damage. Exp Dermatol. 2016; 25(6): 447-452. Barolet D, Christiaens F, Hamblin MR. Infrared and Skin: Friend or Foe. J Photochem Photobiol. 2016; B 155: 78-85. Hormesis. (n.d.) In Wikipedia. Retrieved April 25, 2018, from https://en.wikipedia.org/wiki/Hormesis. Schroeder P, Haendeler J, Krutmann J. The role of near infrared radiation in photoaging of the skin. Exp Gerontol. 2008; 43: 629-632.